Langley residents crave more free time, and SYNLawn Vancouver can help with artificial turf landscaping solutions. Our landscaping professionals make it possible to spend less time maintaining the lawn and more time focusing on your family, hobbies, and other duties. Artificial grass is not like what it was decades ago. Today, it is soft, sod-like, and made with high-quality materials that are built to last year after year. High drainage rates ensure rapid dispersion of rain and melting snow, revealing an always-green lawn that is safe for pets and kids year-round. With more than 20 different artificial turf blends to choose from, there is a SYNLawn solution for homes and businesses throughout the Langley Township. Our products are used everywhere from rooftops to basements and traditional backyard landscaping. There are so many ways to incorporate the conveniences of artificial grass into your lifestyle. In addition to landscaping, many opt to include SYNLawn’s realistic fake grass inside their homes and businesses. This is a great way to get the indoor golf green or golf course complex you have always dreamed of. Athletic training centers love how resilient and forgiving SYNLawn’s SpeedTurf™ is. It stands up extremely well to even the most rigorous tasks, such as weight lifting and CrossFit. Allow us to show you how it is used for indoor tracks, sports fields, and much more. Parents love that artificial grass is a kid- and pet-safe surface both indoors and outdoors. Our artificial grass and turf are even ideal in areas of high-traffic to eliminate unsightly brown spots. SYNLawn Vancouver offers a complete artificial turf playground system built to pad kids’ active play. This is why both parents and businesses love using these systems for outdoor playgrounds. Above all else, we are dedicated to helping you conserve water and enjoy life more. It’s time to experience what more free time and money means for your lifestyle and your home or business in Langley, BC. 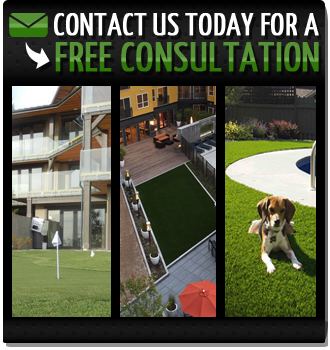 Contact SYNLawn Vancouver for a completely free consultation today! This is the best way to see and feel the products up close before choosing a design.